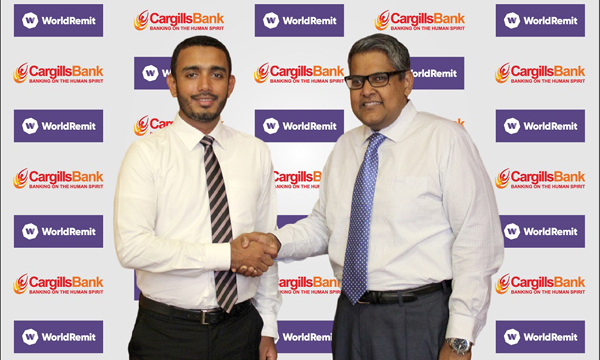 Cargills Bank Ltd. announced it is joining forces with WorldRemit, a leading digital money transfer service, to strengthen cross-border inward remittance services offered by the bank. Approximately, 1.7 million Sri Lankans live abroad. By partnering with WorldRemit, the bank is enabling the diaspora in over 50 countries to send money home to its network of 350+ countrywide cash pick up locations at Cargills Bank and Cargills Food City outlets. Remittances play an important role in Sri Lanka’s economy. As one of the top four receivers of remittances in South Asia, the country received over $7.5 billion in remittances in 2018, according to estimates by the World Bank. WorldRemit is changing the way people send money. The company currently sends from over 50 countries to more than 145 destinations. Transactions to Sri Lanka via WorldRemit grew by nearly 60% in 2018, driven by the rapid expansion of the company’s partner network. Recipients of remittances in Sri Lanka can now collect their funds via bank transfer, mobile money, or at over 2,000 cash pickup locations across the country. WorldRemit’s global headquarters are in London, UK with offices in the United States, Canada, South Africa, Singapore, the Philippines, Malaysia, Japan, Australia and New Zealand. “Cargills” is a brand that has been faithfully serving Sri Lankans for 174 years, built on a foundation of values and ethics. True to this heritage, Cargills Bank is taking banking to the masses by being inclusive and accessible. The amazing Cargills Cash Savings Account is available at over 370 Cargills Food City outlets, allowing you to do grocery shopping and banking at the same place at your convenience. Cargills Bank’s Head Office is in Colpetty, with branches at Maitland Crescent, Maharagama, Old Moor Street, Wattala, Rajagiriya, Kandy, Peradeniya, NuwaraEliya, Ratnapura, Thanamalwila, Matara, Galle, Kurunegala, Chilaw, Kaduruwela, Vavuniya, Chunnakam and Jaffna. Cargills Bank is a fully-fledged licensed commercial bank with a BB (lka) Fitch Rating.